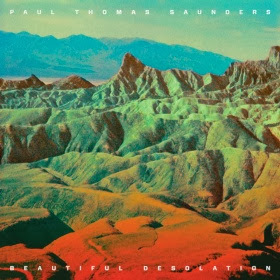 Leeds soundscaper Paul Thomas Saunders made a welcome return earlier in the year with 'Kawai Celeste', a wide-eyed dream-pop track that will be appearing on his forthcoming 'Beautiful Desolation'. We've got another wondrous track from said album with the bizarrely titled 'Wreckheads & The Female Form'. I may not know what 'Wreckheads & The Female Form' is about but I do know that it's quite lovely, with a tinge of The Sound Of Arrows about it. With less of the dancey vibe but similarly sparkling nonetheless. It also reminds me a bit of Aled Jones's iconic 'Walking In The Air', although that may be misconstrued as a negative. When it clearly isn't. Have a listen to the new track, along with another album cut 'In High Heels Burn It Down', below. 'Burning Desolation' is out on 31st March. Find more info at paulthomassaunders.com.